India’s most sort after fashion designer, Manish Malhotra, made his stop over in London on Saturday 23rd Feb at the Grosvenor House Hotel, Park Lane. It wasn’t just any fashion show for us Londoners. The show was in support of the Angeli Foundation – a charity that works to empower the Girl Child in India and in association with Dubai based Rivaage boutique. 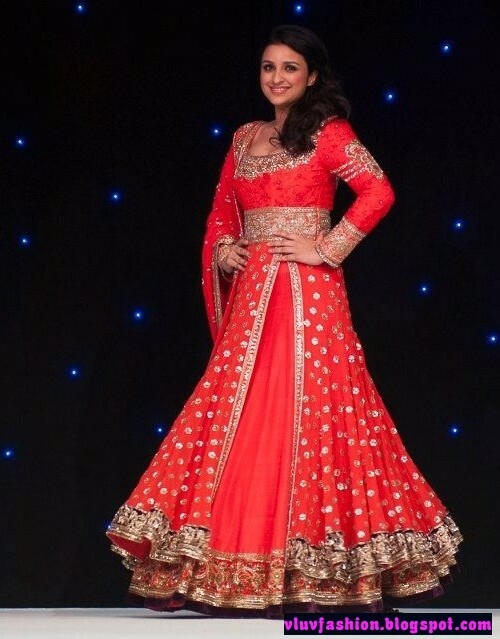 With a stunning collection coming to an end in front of a 450 strong audience, it was Parineeti Chopra who stepped her way onto the catwalk for the closing of the show in a glittering floor length red and gold anarkali lehnga. Bollywood stars Urmila Matondkar and Parineeti Chopra added to the already glitz and glam to the evening. Urmila opened the show for Manish wearing an elegantly fitted and styled navy lehnga woven with white chikankari.